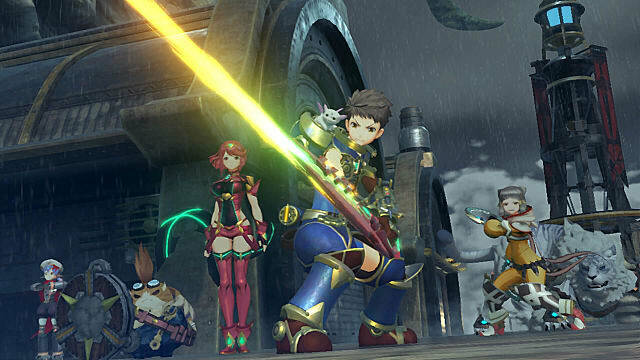 The combat system in Xenoblade Chronicles 2 gets pretty engrossing once you understand all of its bells and whistles. The problem is, while the tutorial may spread out the introduction of many of these mechanics to make it easier to digest, it doesn't do a great job of demonstrating what it's talking about. It took quite a bit of trial and error, but now that I have a solid grasp on the combat system, I fully intend to share it with you. Whether you're confused about elemental Blade Combos or trying to figure out how to maximize the potential of your Chain Attack, you're bound to find the answers you're looking for here. It really does make the experience that much better. Before you can truly master the techniques that deal megatons of damage, you first need a solid grasp on the basics of combat. 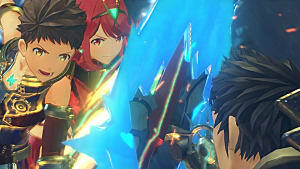 This section details the revamped Auto Attack, using Driver Arts, Attack Canceling, building up your Special, and switching Blades. If you already feel confident with the basics of combat, feel free to skip on to the next section, but remember to always keep these in mind. Unlike past entries, your Auto Attack actually halts completely when you move, only starting again once you've planted your feet firmly in one position. While this may not seem like too big of a deal at a glance, you'd be surprised how much the Auto Attack plays into the combat system overall. For starters, every hit of your Auto Attack slowly builds up the gauge on your Driver Arts. Once the gauge on an Art is full, its icon lights up, and the Art becomes usable by pressing the corresponding face button. Using the Art depletes its energy, requiring you to charge it back up again with Auto Attacks. However, if you just use Arts as soon as they become available, not only are you making poor strategic decisions, but you're also missing out on dealing a lot more damage. By using an Art at the end of one of your Auto Attacks, you perform what's called an Attack Cancel, indicated by a ring that appears in the middle of the screen when you succeed. By Attack Canceling into an Art, it becomes more powerful. The further you are into an Auto Attack chain, the better the result. This means that timing your Attack Cancels on the last hit of an Auto Attack chain is ideal for maximizing your potential. As if the extra damage wasn't enough of an incentive to Attack Cancel everything, it also serves to build your Special Attack gauge much faster than it would otherwise. Using only Arts, you can build the Special gauge up through three levels of power, each with its own animations and Quick-Time Events (QTEs). 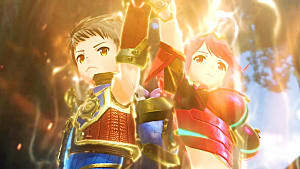 Once at the third Special level, you can reach a fourth by having maximum Combat Affinity with your equipped Blade, indicated by a golden resonance line. You achieve high Combat Affinity with your Blade by simply standing near them and not switching them out for awhile. When you go to finally use your Special, consider Attack Canceling with it too for a bit of extra damage. 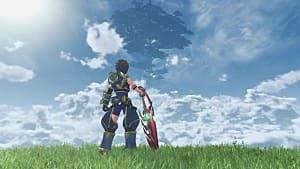 You can even Attack Cancel when you go to switch Blades via the D-Pad so that they arrive in battle with their abilities ready to go. With the fundamentals down, we can finally move on to the fun stuff. By utilizing elemental Blade Combos, Driver Combos, Fusion Combos, Elemental Orbs, and Chain Attacks in just the right way, you can pull off techniques that deal truly delightful amounts of damage. A Blade Combo begins when you unleash a Special Attack of any level on an enemy. 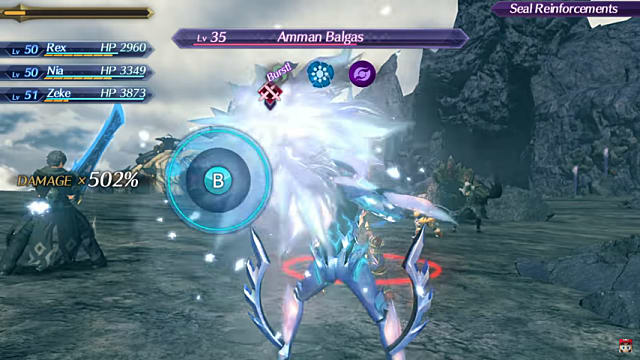 A timer with an element attached to it appears on the top-right of the enemy's health bar alongside a rather confusing pyramid of elemental icons and effects that pops up in the top-right corner of the screen. Both the countdown timer and the flashing elemental icon represent the element of the Special you just used. On the right side of the currently flashing icon are two different elemental icons. 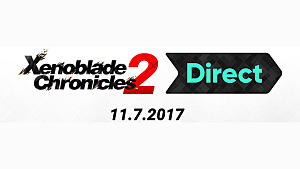 These icons represent different branches that you can go down to reach the end of the Blade Combo. 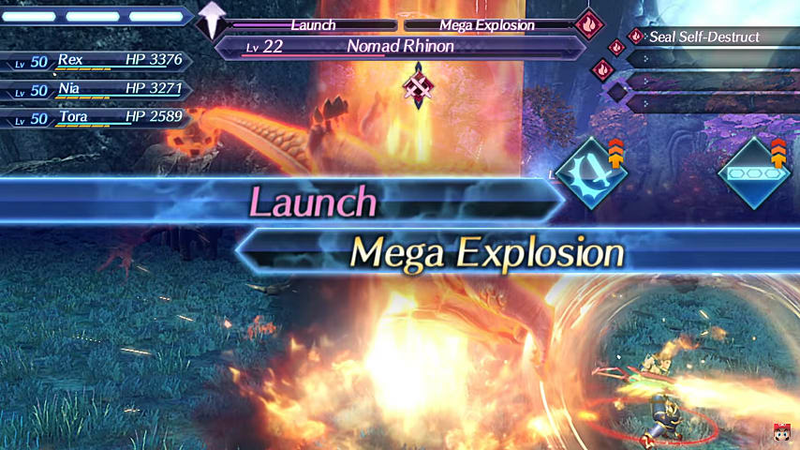 In order to continue the Blade Combo, you need to switch to a Blade of either of the two elements in the column directly to the right of the starting icon, and unleash their Special after it's been built up to level 2 or higher. If it's not at least level 2, it won't advance the Blade Combo, and you'll lose precious time. You have until the timer depletes to continue the combo or it will fail, and you'll have to start over. Once in the second stage of the Blade Combo, you'll notice that half of the four elemental icons that were originally available in the final column are now entirely inaccessible. That's because when you decided which of the two elements you'd use to continue the combo, you also locked yourself down a branching path. If you're stuck without a Blade that can finish the combo, then you're out of luck, so it's important to plan ahead and choose a path that you can complete. 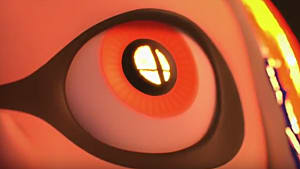 To finish the Blade Combo, repeat what you did to continue it by switching to a Blade that matches one of the two elements left in the column directly to the right of the blinking icon and unleashing their Special after it's been built up to level 3 or higher. 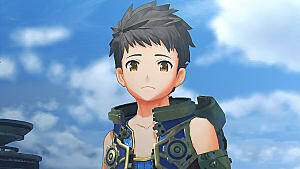 Note that if computer-controlled Drivers in your party have Blades equipped that can continue an active Blade Combo, they will automatically switch to that Blade, and the ability to activate their Special via ZL or ZR is locked until it reaches a level that can successfully advance the combo. You can figure out what level their Special is currently at by counting the number of dots circling their character portrait. 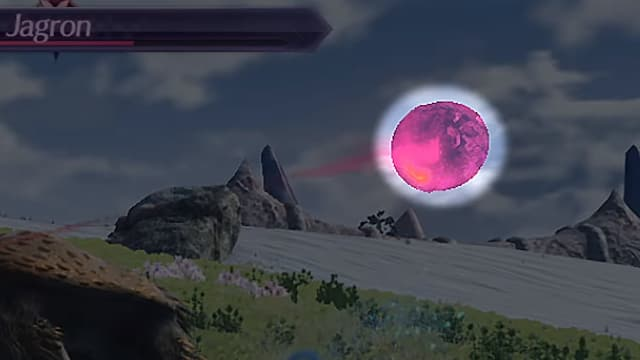 Once you finish a Blade Combo, an Elemental Orb appears to circle around the enemy and seal its potential to perform certain types of attacks. The potential you seal is determined by whatever move you finished the combo off with, while the element of the last move determines which Elemental Orb appears. You can continue to surround the enemy with additional Elemental Orbs to seal more abilities and increase your Chain Attack potential so long as you're using different elements. Trying to make an Elemental Orb of the same element as one already in play will just result in the old one getting replaced. With the knowledge of how to complete a Blade Combo under your belt, you can take Driver Combos and Chain Attacks to a whole new level. Anyone familiar with the series will immediately recognize Driver Combos. These Driver Combos are essentially strings of attacks that juggle enemies, leaving them unable to attack or defend themselves. Some of your Arts inflict additional status effects -- such as Break or Topple -- when used at the right time. If the proper order of operations isn't followed, however, the status isn't inflicted, and the Driver Combo won't properly advance. The order goes Break, Topple, Launch, then Smash. A Break can be activated at any time to start a new Driver Combo and must be followed up with Topple, then Launch, then finished with Smash. When Break is activated, a timer pops up on the top-left side of the enemy's health bar that slowly counts down the time you have left to continue the Driver Combo before it breaks. The Topple and Launch timers count down progressively faster than the first, though, so make sure all of the necessary Arts you need are ready. If you time a Driver Combo so that the timer for Break, Topple, Launch is active when you finish a Blade Combo, you perform what's known as a Fusion Combo. A Fusion Combo's finishing Special deals loads of damage, so make sure you look out for these opportunities. Now that you know how to perform Driver Combos and Fusion Combos, we can talk about maximizing your damage potential through Chain Attacks. You won't be able to use Chain Attacks until they're introduced to you in the game, but you'll quickly find that they are devastating when executed just right. 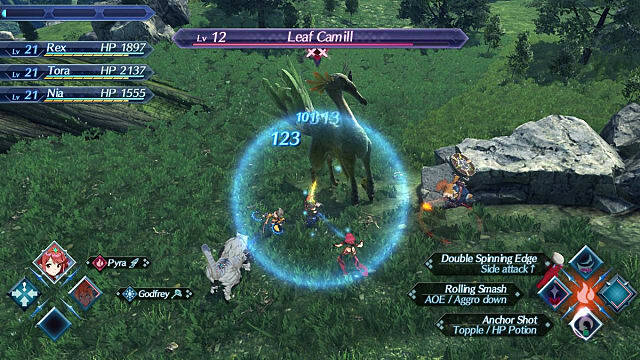 Once all three bars of the Party Gauge are full, you can activate a Chain Attack by pressing the + button. With this technique, every Driver in the party gets a chance to unleash a Special with any of their equipped Blades. Additionally, this is the point where you burst down any Elemental Orbs you set up with Blade Combos. If you manage to burst Elemental Orbs, you earn extra Chain Attack rounds and can even unleash mind-numbing amounts of damage with a Full Burst if you destroy enough orbs. Fire vs. Water -- During Chain Attacks, Fire Specials burst Water Orbs, and Water Specials burst Fire Orbs. 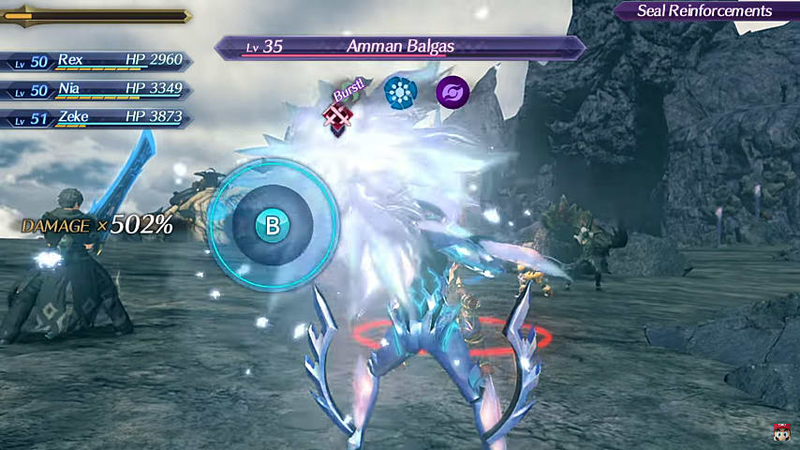 Wind vs. Ice -- During Chain Attacks, Wind Specials burst Ice Orbs, and Ice Specials burst Wind Orbs. Earth vs Lightning -- During Chain Attacks, Earth Specials burst Lightning Orbs, and Lightning Specials burst Earth Orbs. Light vs. 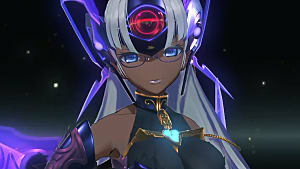 Dark -- During Chain Attacks, Light Specials burst Dark Orbs, and Dark Specials burst Light Orbs. 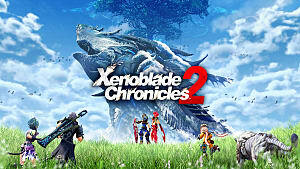 Creating Elemental Orbs with Blade Combos and Fusion Combos and bursting them all during a Chain Attack is the key to dealing maximum damage in combat. It's a lot of setup, but the frightening amount of damage you'll deal in the end is well worth it. Now that you have the combat system down, how do you like it? Is it fun to build up and maximize your damage potential, or does it still feel like a slog? Let us know in the comments below!